This week I sewed my first ever pattern from True Bias. I was beyond excited when I stumbled across the Yari Jumpsuit on The Fabric Store blog two weeks ago. 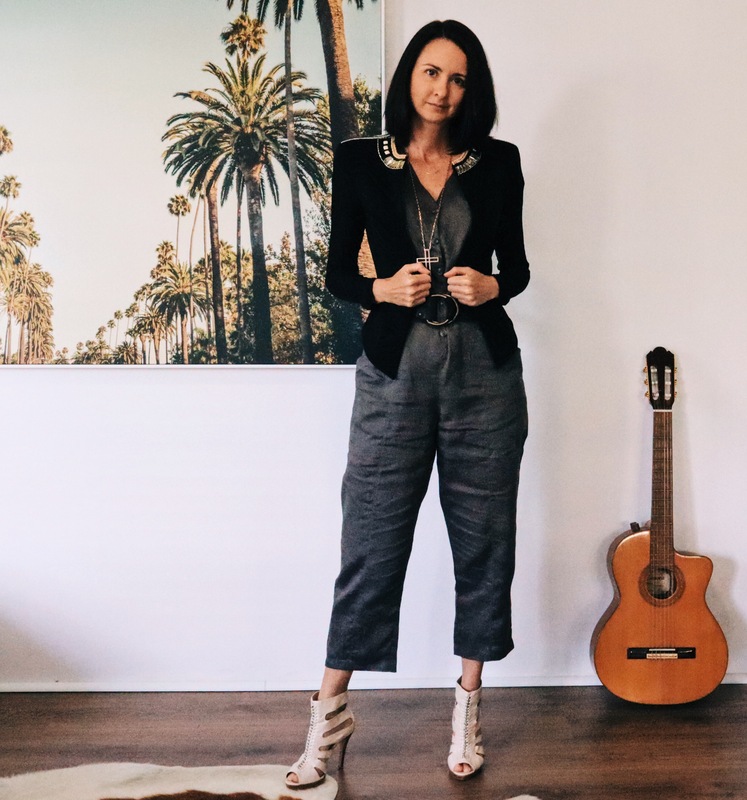 I knew from the moment I saw it that I needed that Jumpsuit in my life sooner rather than later. A good Jumpsuit has become a wardrobe staple. I love that you can wear the Yari Jumpsuit super casual or style it up with heals and an evening jacket. A multipurpose wardrobe is an efficient wardrobe! Style it up with a belt and heels. Style it down with your sneakers. Until recently I didn’t even realise that there was such a thing as downloadable, print at home patterns. In all honesty, I have been completely naive to the amazing network of home sewers and pattern makers that share their knowledge and creativity through online channels. I am amazed at the numbers of indie pattern labels that exist and can’t wait to bring more of their amazing work to life, adding in my Marsha Style hacks along the way. The print at home pattern for the Yari Jumpsuit was a total of 66 A4 tiles that where glued together to create the pattern. Due to my limited space at home I glued sections and cut out pieces as they became complete. I found the process quite satisfying. It took a total time of two glasses of my favourite Rosé to complete the task. I have since discovered my local Officeworks prints AO size and will definitely take that route next time. While the cost of the downloadable pattern is cheaper than the printed version, the added costs of printing does make these patterns quite exy. However, in saying this, the shipping costs and time delays when purchasing a printed pattern from the other side of the world are also significant. My personal choice hands down is the instant gratification of the downloadable pattern. Also as a pattern maker myself I appreciate the time and effort these small indie pattern labels put into creating their patterns. My fabric choice was a mid weight linen from The Fabric Store in Gravel. Big shout out to The Fabric Store for their super speedy delivery. The width of the fabric was 52” so I opted to buy 3.25mts. I made the Yari Jumpsuit in a US size 6 (equivalent to AU size 10) and was able to cut the pattern from 2.75mts. I highly recommend laying your entire pattern prior to cutting to figure out your best possible yield. Fabric is money and should be used wisely with minimal wastage. The Yari Jumpsuit pattern was notched very well and the sewing instructions where very clear and easy to follow. To achieve a great finish on your garment be sure to press seams as you go. I am a big avocate of pressing my hems before sewing as well. It took me approximately 4hrs to cut and sew my Jumpsuit as well as the two glasses of wine to glue and cut the printable pattern. I am so happy with the end result and have already thought of how I am going to sew my Yari Jumpsuit next time and add a little Marsha Style twist to it. I am quite long in the torso so next time around I am going to add about 2.5cm length through the waist just to drop the crotch slightly. Otherwise the fit was spot on 👌🏼. If you dislike hand sewing buttons as much as I do try sewing buttons on with your machine. It’s super easy. All you need to do is remove your foot, turn your machine to zig zag mode and reduce your stitch length to zero. Hold your button in place and lower the foot shank onto the button just behind the holes. Zig zag by hand for a couple of turns to ensure the machine is stitching from hole to hole and then put the pedal to the medal for approximately 8 stitches. Your button is now secured with no hand stitching required.